This page hosts the public data repository described in our 2006 Haptics Symposium paper: Standardized Evaluation of Haptic Rendering Systems. To provide publicly-available data sets that describe the forces resulting when a probe is scanned over the surface of several physical objects, along with models of those objects. This data can serve as a "gold standard" for haptic rendering algorithms, providing the "correct" stream of forces that should result from a particular scanning trajectory. To provide a standard set of analyses that can be performed on particular implementations of haptic rendering algorithms, allowing objective and standardized evaluations of those algorithms. To present the results of these analyses collected from several publicly-available implementations of haptic rendering algorithms, as reference data and as examples of potential applications of these data sets. Physical models are scanned and used for analysis of haptic rendering techniques according to the following pipeline; we use the term trajectory to refer to a stream of positions and forces. Scanning: The HAVEN at Rutgers University is used to scan several aspects of a physical model. First, the object is scanned with a laser range scanner to obtain a precise polygonal model of the surface. An optically-tracked force sensor is then scanned manually across the surface of the object, providing position and orientation information that is time-referenced to force and torque data. We call this recorded trajectory a raw trajectory. Out-trajectory generation: We can determine when our scanning probe was in contact with the object using normal force informaiton. Whenever the probe was in contact with the object, the reported position data should contain points that lie on the surface of the object. However, due to small amounts of noise in our measurement, the recorded path deviates slightly from the surface of the object. We therefore project this trajectory onto the surface of the object whenever the force data confirms that the probe was in contact with the object. We call this slightly- modified trajectory an out-trajectory. In-trajectory generation: Haptic rendering systems often depend on allowing a haptic probe to penetrate the surface of a rigid object before penalty forces are applied to the haptic device. The data collected from the physical scan of a rigid object contains normal forces and a trajectory that lies entirely on the surface of the object. We therefore analytically compute a trajectory that moves below the surface of the object that - if passed as input to an ideal haptic rendering algorithm, would apply the same forces to the haptic device that we measured in our physical scan, and would graphically present a surface contact point that corresponds to the trajectory we measured in our physical scan. We call this hypothetical trajectory an in-trajectory. Haptic rendering: This in-trajectory can then be fed to any haptic rendering algorithm, in place of the position data that would typically come from a haptic device. The haptic rendering algorithm will generate a stream of forces (which would typically be applied to a haptic device) and - generally - a surface contact position (which would typically be rendered graphically). We call this trajectory a rendered trajectory. Comparing our rendered trajectory to our raw trajectory provides a quantitative basis for evaluating a haptic rendering technique. This page will soon include quantitative results comparing various rendering algorithms according to the metrics presented in our paper. This section describes the data formats in which all files on this page are presented. Mesh files, representing scanned object geometry, will be presented in .obj format. Meshes will be in the same reference frame as the corresponding data files. Trajectory files are presented as .traj files, tab-delimited ASCII files containing position and force data, plus associated metadata. A field value extends from the '=' to the end of the line, and is generally a single number but may be text for some fields. The metadata portion of the file is terminated with the token DATA_START; all subsequent lines contain trajectory data. This indicates that the field contains 31800 data points organized in 8 columns, labeled according to the field 'column_labels'. Other fields may appear in a data file to indicate particular parameters that were used to generate that file. The "time offset" metadata field is for interal debugging only; it is not meaningful to other users of this data. The "computation time" data field is meaningful only for computational results; it indicates how much time was spent computing this particular data point (i.e. it excludes time related to disk i/o, graphic rendering, etc.). This section contains several data sets acquired with our scanner and processed with the pipeline described above. Data is specified in the .traj format defined above. Note that the forces in an "in-trajectory" file are defined to be zero, and the normal forces in an "out-trajectory" file are defined to be one or zero, representing contact or non-contact with the object surface. This section contains utility code used to process our data formats, and will later be updated to include example analyses. Also see CHAI 3D for the haptic and graphic rendering code used for our analyses. read_traj_file.m, a Matlab function for reading the contents of a .traj file, including all data and metadata. plot_trajectories.m, a Matlab script for graphing the positions and forces presented in a series of .traj files. Uses the previous function (read_traj_file) for file input. This section contains several analyses performed using the above data. The results presented here serve as reference data for comparison to other algorithms/implementations, and the approaches presented here provide examples of potential applications for this repository. The duck model and trajectories provided above were used to find the optimal (most realistic) coefficient of dynamic friction for haptic rendering of this object. This analysis uses the friction cone algorithm available in CHAI 3D (version 1.31). The in-trajectory derived from the physical-scanned (raw) trajectory is fed to CHAI for rendering, and the resulting forces are compared to the physically-scanned forces. The coefficient of dynamic friction is iteratively adjusted until a minimum error between the physical and rendered forces is achieved. 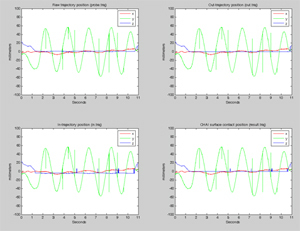 This analysis demonstrates the use of our repository for improving the realism of a haptic rendering system, and also quantifies the value of using friction in a haptic simulation, in terms of mean-squared-force-error. We observe that the trajectory computed with friction enabled contains significantly lower force-vector-error than the no-friction trajectory, indicating a more realistic rendering, with a negligible increase in floating-point computation. 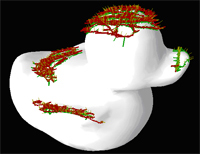 The duck model and trajectories provided above were used to compare the relative force errors produced by proxy (god-object) and voxel-based haptic rendering algorithms for a particular trajectory, and to assess the impact of voxel resolution on the accuracy of voxel-based rendering. This analysis does not include any cases in which the proxy provides geometric correctness that the voxel-based rendering could not; i.e. the virtual haptic probe never "pops through" the model. Voxel-based rendering was performed by creating a fixed voxel grid and computing the nearest triangle to each voxel center. The stored triangle positions and surface normals are used to render forces for each voxel through which the probe passes. We observe that the voxel-based approach offers comparable force error and significantly reduced online computation, at the cost of significant preprocessing time and memory overhead, relative to the proxy (god-object) approach. Analysis of this particular trajectory does not capture the fact that the proxy-based approach offers geometric correctness in many cases where the voxel-based approach would break down. The duck model and trajectories provided above were used to quantify the impact of force shading on the accuracy of haptic rendering of a smooth, curved object. Force shading uses interpolated surface normals to determine the direction of feedback within a surface primitive, and is the haptic equivalent of Gouraud shading. Friction confounds the effects of force shading, so the forces contained in each out-trajectory were projected onto the surface normal of the "true" (maximum-resolution) mesh before performing these evaluations. Results are presented for several polygon-reduced versions of the duck model, including the average compute time per haptic sample (on a 3GHz P4) and the total computational cost in floating-point operations (for the complete trajectory). We also indicate the percentage reduction in RMS force error due to force shading. We observe that force shading results in a significant reduction in RMS force error - as much at 36% - for models of typical size, at some cost (approximately 20%) in floating-point operations). For models at the maximum available resolution, force shading is not expected to contribute significantly to rendering quality, and indeed we see the error reduction fall off as meshes get very large. For models that are reduced to only several hundred polygons, the geometry no longer effectively captures the shape of the original mesh, and we see a falloff in error reduction as the quality of rendering decreases. Please email us with any contributions or to discuss the data presented here. We welcome any information you have about how you're using this data or how it could be made more useful. Support for this work was provided by NIH grant LM07295, the AO Foundation, and NSF grants IIS-0308157, EIA-0215887, ACI-0205671, and EIA-0321057. Any opinions, findings, and conclusions or recommendations expressed in this material are those of the author(s) and do not necessarily reflect the views of the National Science Foundation.